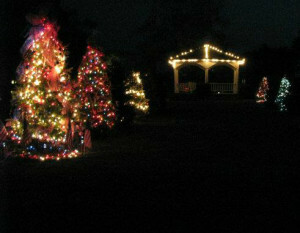 The Holiday Season in Jefferson Texas begins the Friday after Thanksgiving every year. Friday evening everyone in town gathers over at the Lions Park on the corner of E. Jefferson St. and Line St. 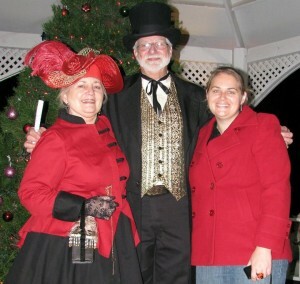 The festivities begin at 7:30 PM which is later than in the past because of the KCS Holiday train being in town. At the park you’ll see the Enchanted Forest of Christmas Trees all decorated by many different businesses, churches, local organizations and families. Once everyone is gathered around the gazebo announcements are made and there may be a special guest or two, then a bit of Christmas Caroling begins and the light switch for the trees and gazebo is turned on. While all of this is going on Santa makes his way to the gazebo so he can take his place for the children to sit on his lap and have a chat about their wish list regardless of what their naughty or niceness throughout the year might have been. While the children are with Santa most everyone attending starts to wander around through the forest gazing at all the lit Christmas trees while shaking hands or giving a friendly wave to friends and neighbors there. I swear you can almost feel the atmosphere change to a feeling of warmth and happiness. Visit the White Oak Manor bed and breakfast Facebook Page for more up to the minute information about added activities around town.